Source: Mexico and the U.S.
Handling Tips: 34-36°F. Keep dry. General Information: An interesting edible to say the least, the cactus leaf combines the flavors of green beans, bell pepper and asparagus with a unique "bite" of its own. After de-thoming, the cactus may be boiled, steamed or sauteed. Very versatile, cactus diced or sliced work well in omelettes, salsas, deep- fried or combined with tomatoes, garlic and cilantro as a vegetable dish. 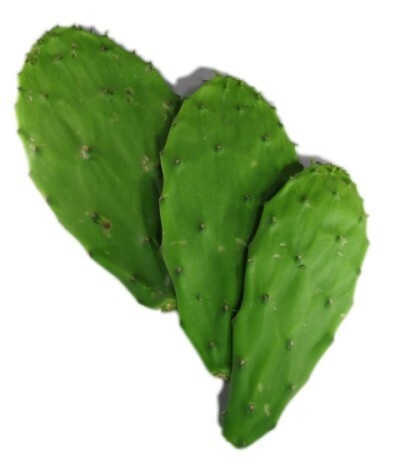 High in vitamins A and C.
Applications: The fresh cactus leaf should be rid of any spines before attempting to eat it. The leaves should be scrubbed with a scrubbing pad. Th base is sliced to make a clean cut, and a thin strip trimmed along the outside edge of the leaf. After washing thoroughly, the leaf may be sliced french-fry style or diced. They can be eaten raw or added to cooked ingredients. History: Cactus is a plant native to the Americas. While there are many types of cactus grown for food, fodder, building material, dyes and medicines, there is only one genus that combines all of these attributes into one balanced whole. This amazing plant is the Opuntia, also called the Nopalea. The tribes of Mexico and the desert Southwest used Nopalea extensively in everyday cooking. Nopalea has a healing reputation and is an environmentally sound and sociologically friendly plant to grow, it requires far less water and fertilizers than most other crops.